Of course Tam and I are awake by 4.30am and wander downstairs at 5.00am where Deb and Matt are already up. Matt manages to get the massive TV in the living room working and the weather forecast predicts a couple of days of near record highs of 90° C. There is also a cold snap on the way after the weekend with temperatures dropping to the mid 70s, but sunny. The ladies are in the pool by 5.30am while I catch up on my trip report. I gain points when I tell them not to spend too much time in the hot tub or they will go wrinkly and immediately lose them again by pointing out that they were wrinkly before they got in. The girls rise and we have breakfast before getting ready to head out to the Animal Kingdom. We arrive just after 9.00am and the Stringers get their Annual passes from Guest Services. Its the first time we have ever had Annual Passes so I savour the moment. 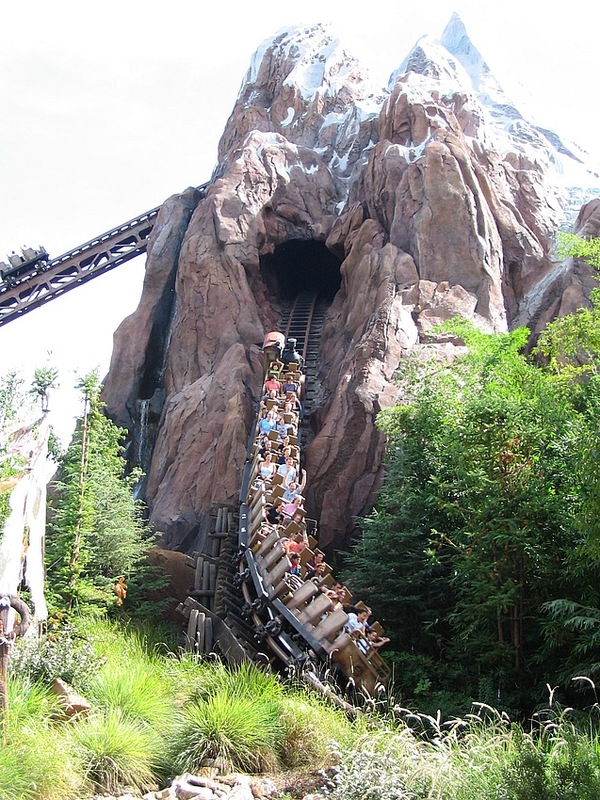 Off to Expedition Everest where we grab Fast Passes before joining the standby queue. The sign says 10 minutes, but in reality we walk slowly through the queue area straight to the boarding platform. There is no doubt this is an excellent ride with just the right amount of speed and excitement, but it doesnt do much for my well being. I had read a report recently about a lady feeling sick after riding and I understand why now. I think it is the long high-speed turn just after the big drop that does it for me. Its not quite as bad as Mission Space, but its close. Much huffing and puffing and drinking of water is required afterwards to keep breakfast in its appropriate position. Matt shows his customary understanding by calling me a big Jessie. Or was it a big girls blouse? Either way it wasnt complimentary. Its a really great ride and I would love to go it again, but its another to be added to the Kevin Stringer do once in a blue moon list. ....... it's the coming down that's not good for you. Next is Kilimanjaro Safaris, which at least lets me sit down for 20 minutes. We pass the Ostrich eggs which, as Matt points out, seem to have a gestation period of 5 years and have miraculously managed to move themselves 6 feet to the left. Clever beggars them Ostry. At this point we bid a temporary farewell to Deb and Matt as they are going shopping at the Mall at Millennia. Unfortunately we are shopping this afternoon as well. Talk about kicking a man when hes down. Kali River Rapids is next where we all stay comparatively dry. 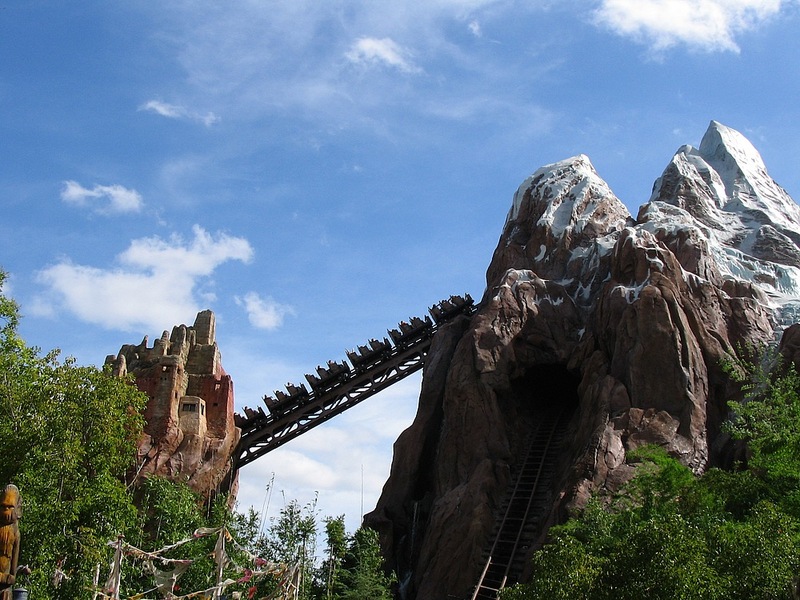 The Fast Passes for Expedition Everest are nearly up so we head back there for Tam, Georgia and India ride while I get a Coke and watch the high speed drop from the viewing area. Georgia even manages to open her eyes to see the Yeti this time. We now leave the park and drive to the Florida Mall where we have lunch to fortify ourselves against the ordeal that is soon to come. We eat in Ruby Tuesdays, chosen on the basis that its the first restaurant we come across. A few years ago this would have been quite an experience for a Brit in the US, but we now have many similar chain restaurants in the UK. The only difference is that the burgers are better here and the service is more friendly and efficient. Tam amazes me during the meal by proclaiming that she isnt really enthusiastic about shopping! If it werent for the necessity of getting one or two things for the girls she wouldnt bother. Is it finally coming true? After all these years has the shopping is evil brainwashing started to take effect? I think this is merely a temporary state of mind on her part and normal expenditure will be resumed in the very near future. I leave the women to their shopping and find a place to sit down for an hour and write up the trip report. How ironic that after a couple of hours shopping the only person that leaves the mall with nothing is Tam. She looks at lots of handbags, but nothing is quite right. One too large, one too small, one too plastic, one that failed to solve the thorny issue of global warming but was otherwise perfect. Heck, even I managed to buy a pair of shorts. Back to the villa at 5.15pm where Deb and Matt are studying their wares. Matt has bought some golf balls for me ready for when we play later in the week. Unfortunately he only bought 15, I can lose that many on the first hole. A splash around in the pool is followed by sandwiches of various descriptions and we are ready for the evening pool session. Matt and I play first, but then Deb and Tam decide they want to play. Not a good idea. Spiders start to spin webs over the pockets the game is taking so long. It is decided that we ought to play pairs to speed things up a bit. Me and Tam v Deb and Matt. At least this produces some hilarity. Its not that the girls are doing anything wrong, they are hitting all the right balls, just not necessarily in the right order. Deb looks particularly fetching in her white bath robe, not standard attire for pool, but it cant make things any worse. In the interests of fair play it should be pointed out that the ladies improve over the course of the evening to the extent that Georgia falls asleep on the floor and India takes to reading a book. The end result of all this pool is the Stringers 5, the Churchills 3. On a one to one basis its me 6, Matt 4, but I know he is now a wounded animal (a pussycat with a baddie paw perhaps?) and hell be back for revenge tomorrow.